Second week of trying to wear more dresses for FrOctober - has been harder than the first week I have to say but I managed to do most of the week without jeans. On Saturday, I wore my black jersey Warehouse dress. It's styled like a wrap dress but isn't actually one - no embarrassing windy day moments.. 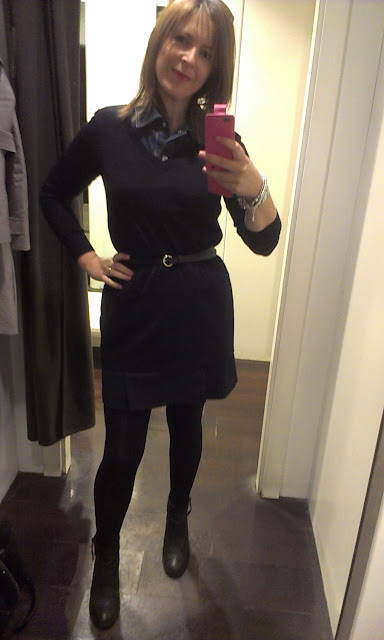 I wore this dress with a turquoise cropped cardigan from H&M and a scarf from Benetton. Black long boots are from Hobbs. Next up was my old reliable blue floral dress that I wore on Sunday to the market. You've seen this dress before on the blog here and here. I wore this dress belted with a charcoal cardigan from H&M, black tights and ankle boots and a black skinny belt from Accessorize. Next dress is a little Zara silk snake print dress that I was a bit wary of but actually love it when it's put with a cardigan, scarf and a belt..
Next is what I wore on Monday, which I shared on this post already..
and finally, two other non-jeans outfits that I'll blog about separately as there's a story behind both..
On the left, another Zara one that I wore over skinny jeans for an event last week (blog to follow) and on the right, a gorgoeus Joe Browns owl print dress that I'll blog about tomorrow! ooh I love that first pic of the black wrap dress and cardigan - what a colour - it's fantastic! I'm 12 days in and proud to say I think I'm going to be able to do the full 31 days without a problem!! these dresses are so beautiful, love how u layered them ! fab...and fair play. I love your scarf from Benetton..
You're looking fierce! 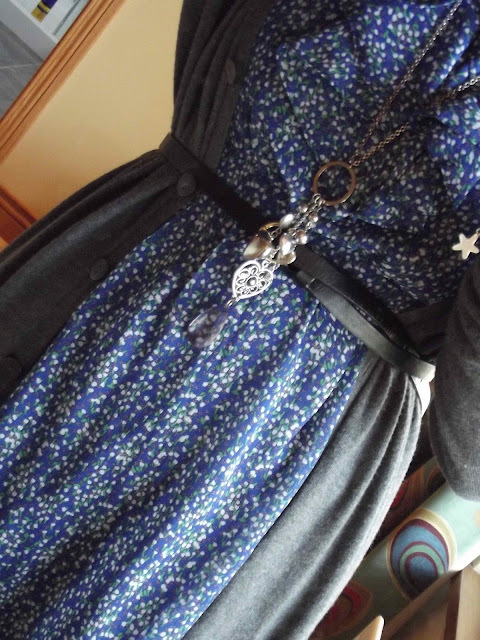 I love the belt over the cardie and dress totally working the trend! Avril, I love these dress posts.....although I have really got into skinnies lately, I really love a dress for day....soooo flattering, so easy to wear....brilliant posts!!!!!!! !